This track plays whenever you're talking to the Gnolams in Master of Orion II, who are described as "dwarf-like" or "gnomish" - kind of lazy to just call their race "Gnolams" then, right? 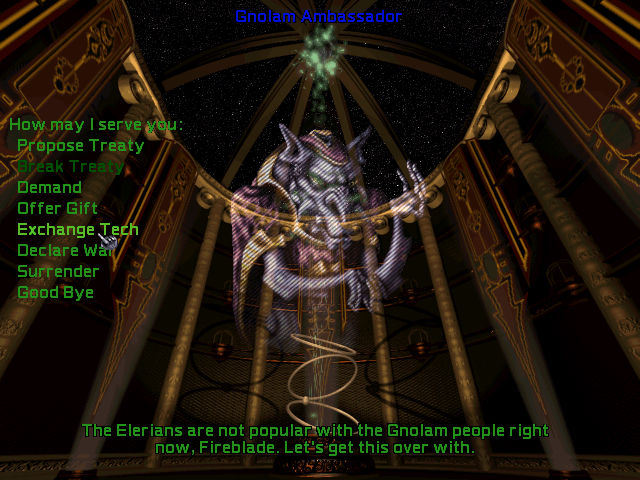 :) The Gnolams are basically the Ferengi of Master of Orion II, a race small in stature and not terribly good at combat either (thanks to them hailing from a Low-G homeworld) but they are proficient at making money which means they generate more income than other races by default. They also have the "Fantastic Traders" trait meaning trade treaties are more lucrative for them and they generate more income when colonies are tasked to produce Trade Goods. Finally, the Gnolams are considered "Lucky" (so, I guess that makes them the Domino of MOO 2 as well?) which in gameplay terms means that Antarans are less likely to attack them, they don't suffer from bad random events, and are more likely to benefit from good random events. The theme for the Gnolams is a slow, oboe piece that just plods along, a bit like the Duck in "Peter and the Wolf". It seems to be an appropriate tune for a race that worships wealth and greed.